Judo is a modern martial art, combat and Olympic sport, created in Japan in 1882 by Jigoro Kano. Its most prominent feature is its competitive element, where the objective is to either throw or takedown an opponent to the ground, immobilize or otherwise subdue an opponent with a pin or force an opponent to submit with a joint lock or a choke. Strikes and thrusts by hands and feet as well as weapons defenses are a part of Judo, but only in pre-arranged forms (kata) and are not allowed in competition or free practice (randori). A Judo practitioner is called a judoka. The philosophy and subsequent pedagogy developed for Judo became the model for other modern Japanese martial arts that developed from koryū (traditional schools). 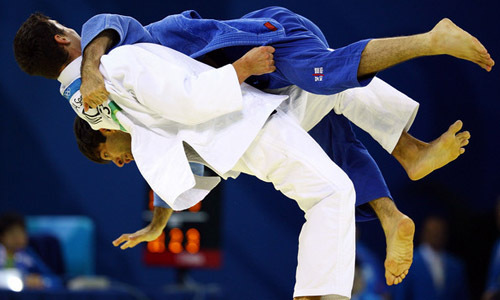 The worldwide spread of Judo has led to the development of a number of offshoots such as Sambo and Brazilian Jiu-Jitsu. Contest (shiai) is a vitally important aspect of the discipline and Judo became an Olympic sport for men in the 1964 Games in Tokyo. Several Judo practitioners have made an impact in Mixed Martial Arts. Notable Judo trained MMA fighters include former Russian national Judo championship Bronze medalist Fedor Emelianenko, UFC fighters Karo Parisyan, Antonio Silva, Rick Hawn, Hector Lombard, Olympic medalists Hidehiko Yoshida (Gold, 1992) and Ronda Rousey (Bronze, 2008). Judo has been one of the primary martial arts displayed in Mixed Martial Arts (MMA) competitions since MMA’s inception. The first official MMA fight, the Ultimate Fighting Championship (UFC), was held in 1993. It was advertised as a “no holds barred” fight. At the time, the public perception was that a larger/stronger human could dominate a smaller/weaker human. The fighters came from various martial arts or sports fighting backgrounds, including Judo, Karate, Brazilian Jiu-Jitsu, Boxing, Wrestling, Tae Kwon Do and Kickboxing. They fought until the opponent was knocked out, tapped out (stopping the fight by tapping their hand), or the referee stopped the fight. The winner of the first Ultimate Fighting Championship was a small Brazilian, Royce Gracie, who used Judo/Jiu-Jitsu submissions to defeat opponents twice his size. Royce Gracie is famous for his Brazilian Jiu-Jitsu, a martial art that is derived mainly from Judo. Many MMA fights are ended by submission holds most of which derive from Judo. “Chokeholds are common in Jiu-Jitsu, Judo and Submission Wrestling, and most trainers discuss how fighter need to experience these techniques in order to learn how to resist them”. “Judo resembles MMA’s grappling aspects, particularly when both fighters are on the ground. MMA fans would easily recognize Judo’s submissions — a fighter might “tap out,” or concede the fight, when caught in a chokehold or an armbar”. Brazilian Jiu-Jitsu is derived from Judo which is derived from Jujitsu. The Japanese found judo superior to Jujitsu due to proof in competition where it involved both stand up and grappling techniques. “After a match-up between older styles of Ju-Jitsu and Judo at the Tokyo police headquarters, Judo was named the national martial art in Japan. It was the official art used by law enforcement in the late 1800’s and continues to be popular to this day. During World War II, many U.S. soldiers were exposed to the art of Judo and brought it back to America with them. The first issue of Black Belt magazine in America (1961) featured a sketch of a Judo throw and was a special Judo issue”. Ronda Rousey, a female MMA champion, won a bronze medal in Judo at the 2008 Olympics. “Rousey eventually got an offer to try MMA and had her first professional fight in 2011. She has since defeated all her opponents with a Judo arm lock and is now a champion in the combat sport”.